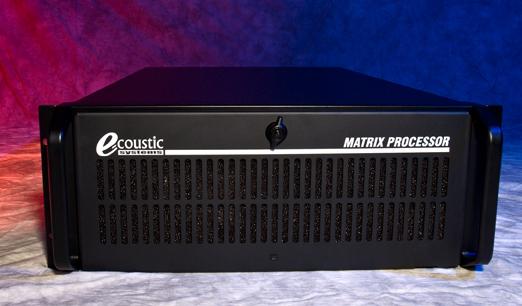 The E-coustic Systems Matrix Processor was designed from the ground up to meet or exceed the requirements of the largest and most critical acoustic enhancement applications With over 8000 internal audio channels, and capacity to support 1024 simultaneous 24 bit digital audio I/O, its performance is unrivaled. The modular hardware integration allows it to be affordably scaled for smaller installations, with a virtually limitless upgrade path. The Matrix Processor can also act as an acoustics server - enabling multiple rooms within a venue to share acoustics processing. The Matrix Processor incorporates a scalable 512 channel point to point matrix mixing system, with level control, delay adjustment and 7 bands of parametric equalization accessible at each input, each output and each matrix point. With such formidable signal processing power, the Matrix Processor accommodates the most complex electronic architecture requirements with ease. However, the Matrix Processor can also provide multiple dedicated channel assignments for film surround and sound effects with separate level control, delay and EQ - which can be independently combined with acoustic signals sent to each loudspeaker. It is even capable of storing recorded sound effects and playing them on cue via MIDI.